The Scythians Colonists—Testimony of Josephus—Magog and his Colony—Statements of our Annals confirmed by a Jewish Writer—By Herodotus—Nennius relates what is told by the "Most Learned of the Scoti"—Phoenician Circumnavigation of Africa—Phoenician Colonization of Spain—Iberus and Himerus—Traditions of Partholan—Early Geographical Accounts of Ireland—Early Social Accounts of Ireland. 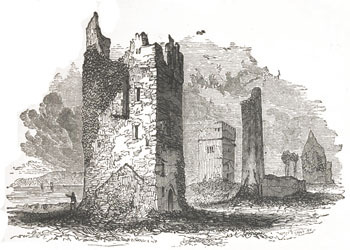 HE writer of the article on Ireland, in Rees' Cyclopaedia, says: "It does not appear improbable, much less absurd, to suppose that the Phoenicians might have colonized Ireland at an early period, and introduced their laws, customs, and knowledge, with a comparatively high state of civilization; and that these might have been gradually lost amidst the disturbances of the country, and, at last, completely destroyed by the irruptions of the Ostmen." Of this assertion, which is now scarcely doubted, there is abundant proof; and it is remarkable that Josephus  attributes to the Phoenicians a special care in preserving their annals above that of other civilized nations, and that this feeling has existed, and still exists, more vividly in the Celtic race than in any other European people. The Irish annalists claim a descent from the Scythians, who, they say, are descended from Magog, the son of Japhet, the son of Noah. Keating says: "We will set down here the branching off of the race of Magog, according to the Book of Invasions (of Ireland), which was called the Cin of Drom Snechta." It will be remembered how curiously O'Curry verified Keating's statement as to the authorship of this work, so that his testimony may be received with respect. In the Scripture genealogy, the sons of Magog are not enumerated; but an historian, who cannot be suspected of any design of assisting the Celts to build up a pedigree, has happily supplied the deficiency. Josephus writes: "Magog led out a colony, which from him were named Magoges, but by the Greeks called Scythians." But Keating specifies the precise title of Scythians, from which the Irish Celts are descended. He says they had established themselves in remote ages on the borders of the Red Sea, at the town of Chiroth; that they were expelled by the grandson of that Pharaoh who had been drowned in the Red Sea; and that he persecuted them because they had supplied the Israelites with provisions. This statement is singularly and most conclusively confirmed by Rabbi Simon, who wrote two hundred years before the birth of Christ. He says that certain Canaanites near the Red Sea gave provisions to the Israelites; "and because these Canaan ships gave Israel of their provisions, God would not destroy their ships, but with an east wind carried them down the Red Sea." This colony settled in what was subsequently called Phoenicia; and here again our traditions are confirmed ab extra, for Herodotus says: "The Phoenicians anciently dwelt, as they allege, on the borders of the Red Sea." Writes.—Josephus, lib. i. c. G. Most of the authorities in this chapter are taken from the Essay on the ancient history, religion, learning, arts, and government of Ireland, by the late W. D'Alton. The Essay obtained a prize of £80 and the Cunningham Gold Medal from the Royal Irish Academy. It is published in volume xvi. of the Transactions, and is a repertory of learning of immense value to the student of Irish history. Sea.—Lib. Zoar, p. 87, as cited by Vallancey, and Parson's Defence, &c, p. 205. Sea.—Herodotus, 1. vii. c. 89.